In a world where alarming headlines are an everyday reality, there is a growing need for clergy, counselors and others who can restore calm, encourage hope and bring people together to strengthen their faith. Bible colleges are designed to help students achieve a deeper understanding of theology and pursue vocations that allow them to serve through ministry, community outreach or missions. The focus on religious studies without the distractions and demands of a more traditional university puts students on a fast track to an online degree in Biblical Studies or Ministry. The best online programs for earning a bachelor's or associate's degree from a bible college are listed below. Snapshots of each college include an overview of academic strengths, learning goals and statistics. Several of the colleges offer a combination of distance learning classes with classroom instruction, while others offer all online programs. Based in Kansas City, Missouri, Calvary University prepares Christians to work and serve in accordance with a biblical worldview. Calvary maintains accreditation through the Higher Learning Commission and the Commission on Accreditation of the Association for Biblical Higher Education. Calvary offers online certificate, associate, and bachelor's degrees in business, education, and ministerial studies. Calvary's online bachelor of science program in interdisciplinary studies includes majors in the Bible, theology, and pastoral studies; pastoral ministry and leadership; English language learner studies; and youth ministry and worship arts. The online interdisciplinary program on the Bible, theology, and pastoral ministry includes 126 credits of coursework comprising biblical and general education credits, electives, and professional education classes. Students take courses on the Old and New Testaments, systematic theology, and contemporary theology. They also study evangelism, theological foundations for ministry, expository preaching, and Greek. The bachelor's degree in interdisciplinary studies offers students foundational biblical and theological knowledge while preparing them for careers in the church, in business, or in other professional settings. Applicants must submit standardized test scores, two references, transcripts, and agree to abide by the Calvary statement of faith. Founded under the tutelage of Dr. M.G. "Pat" Robertson in 1977, Regent's seven schools and two colleges sit on 70 acres in Virginia Beach. More than 130 on-campus and online programs blend a Christian worldview with expertise in fields such as business, education, nursing, and Bible studies. The online bachelor of science in professional studies with an emphasis on biblical and theological studies teaches students how to teach the Bible in a church or ministry, communicate effectively about faith and Christian doctrine, and lead mission or ministry groups. Students prepare for careers as pastors, ministers, and teachers. The degree also prepares students for graduate work. The program includes 120 credits comprising 49 general education credits, 27 global and professional studies credits, 26 elective credits, and 21 credits in Bible and theology concentration classes. Courses in systematic theology, contemporary issues in the church, Christian ethics, and practical evangelism accompany classes in church history, Christian missions, and ministry communication. Eight-week classes provide flexible options for adult learners and military personnel. Applicants submit transcripts and proof of identification. Students also complete an admissions questionnaire. Regent accepts up to 90 transfer credits. Named for the school's founder, LETU opened as the LeTourneau Technical Institute in 1946 and took its current name in 1989. Located in Longview, Texas, the nondenominational Christian institution offers two-year and four-year degrees to more than 3,000 students on campus and online. Online bachelor's degrees at LETU include bachelor of science programs in scripture and theology, Christian ministry, and theological studies. LETU also offers an online bachelor's of biblical studies and ministry degree to students interested in ministry careers. Learners complete 120 credits of coursework on the philosophical and practical aspects of Christian ministry. Major courses provide tools and methods to study, interpret, and apply biblical teachings; build understanding of the historical and cultural development of the Old and New Testaments; and develop speaking, leadership, and communication skills for building effective ministry relationships. The 18 required credits in biblical studies and theology include classes on biblical literature, biblical theology for Christian life, and the history of Christian thought. Students complete 15 credits of Christian ministry classes, including foundations for Christian ministry, contemporary world missions, and worship leadership. Applicants to LETU's online Bible college must submit official transcripts. LETU holds accreditation from the Southern Association of Colleges and Schools Commission on Colleges. Southwestern Assemblies of God University offers more than 70 academic programs, including on-campus and online degrees in behavioral science, business, English, and Bible and ministry studies. SAGU's online undergraduate programs in Bible and ministry include associate degrees in the Bible, church ministries, religious studies, and intercultural studies. SAGU's online bachelor of arts in Bible and theology prepares students for careers in ministry, social services, and community outreach. Students also gain the competencies to pursue graduate study in the discipline. SAGU also offers an online bachelor's in church leadership that features eight specializations: church planting, church revitalization, children and family ministries, media ministry, spiritual formation, worship ministry, pastoral leadership, and youth and student ministries. Applicants submit official transcripts and ACT or SAT test scores. Students can earn up to 45 credits by demonstrating discipline knowledge and applicable work experience. SAGU holds accreditation through the Southern Association of Colleges and Schools Commission on Colleges. The institution also maintains memberships to the Association of Christian Schools International and the Association of Texas Colleges and Universities. Established in Decatur, Texas in 1898, DBU moved to Dallas in 1965. DBU offers more than 110 Christ-centered undergraduate and graduate degrees that train learners to integrate faith and service into their careers. With an average class size of 12, DBU boasts a 13-to-1 student-to-faculty ratio. The more than 75 online programs at DBU include certificates, traditional undergraduate and graduate degrees, and accelerated bachelor's and master's degrees. DBU's online bachelor of arts in biblical studies includes 120 credits of general education, elective, and core classes. Students complete specialized coursework in spiritual formation for Christian ministry, philosophy of religion, Christian doctrine, principles of biblical interpretation, the history of Christianity, and systematic theology. Through a religion practicum, learners participate in a supervised internship with a local church leader or church-related professional. Learners can add a concentration in applied ministry as part of the online bachelor's in biblical studies/master's degree accelerated program. Accelerated master's degree options include children's ministry, Christian counseling, Christian ministry, discipleship, global leadership, theological studies, and worship studies. Applicants must submit official transcripts. Students may receive credit for corporate training or military experience. Transfer students can earn up to 66 transfer credits from accredited, two-year institutions. DBU holds accreditation from the Southern Association of Colleges and Schools Commission on Colleges. Founded in Johnson City, New York in 1932, CSU moved to its current campus in Clarks Summit, Pennsylvania in 1968. CSU's nearly 1,000 undergraduate, graduate, and seminary students enroll in on-campus and online degrees that blend Baptist values with professional competencies. CSU holds accreditation through the Middle States Commission on Higher Education and the Association for Biblical Higher Education. Online associate programs at CSU include 61-credit degrees in addictions counseling, Bible and theology, Christian ministries, and counseling ministries. Bachelor's degrees in six disciplines accompany an online degree-completion program that learners can complete with 30 credits from CSU. Traditional online bachelor's degrees incorporate 121 credits in general education, elective, and specialized coursework. The online bachelor's in Bible and theology includes major courses in Greek and Hebrew, ministry communication, and biblical studies. The flexible program allows students to complete 57 electives to tailor the curriculum to their interests and goals. Students interested in pursuing seminary studies may complete up to 18 credits of dual-enrollment courses applicable to the master of divinity program at CSU. CSU offers flat-rate tuition for undergraduate students and discounts for online undergraduate learners. Tuition discounts also exist for military personnel, veterans, and their spouses; individuals serving in the Word of Life Fellowship; and Anchor Christian University transfer students. Operating under the authority of the Florida Baptist State Convention, BCF held its first classes in Lakeland, Florida in 1943. BCF moved to its current Graceville location during the 1950s and received regional accreditation from the Commission on Colleges of the Southern Association of Colleges and Schools in 1981. One of BCF's 18 online bachelor's degrees, the online bachelor of arts in biblical studies includes 120 credits and trains learners to interpret the Bible for application in ministry settings, graduate study, and Christian service. Students complete general education, biblical and theological foundations, elective, and major courses. Specialized classes in hermeneutics, evangelism, Old and New Testament theology, Hebrew or Greek, and the principles of teaching prepare students for a biblical studies integration course. Biblical studies integration requires that learners review foundational knowledge and skills and apply them to an exegetical research project. Online students can minor in areas such as business leadership, church planting, the Bible, education, music, and worship arts. Applicants submit transcripts and two recommendation letters. Online Bible college students pay flat-rate tuition and BCF offers convenient commuter meal plans for learners who choose to spend time on campus. Ozark Christian College upholds its mission to train learners for Christian service through academic programs that feature more than 50 credits of Bible classes. OCC emphasizes the unity of all Christians through biblical authority. OCC offers associate and bachelor's degrees in the Bible and intercultural studies, biblical communication, Christian foundations, and creative arts ministry. The online bachelor of arts in biblical studies prepares students to teach biblical principles and themes and serve in local church communities. The online bachelor's in biblical studies includes 36 credits of general education coursework, 15 credits of professional education classes, 42 credits of biblical education courses, and 27 elective credits. Professional education courses include ministry, biblical language, and biblical communication. Biblical education classes cover the Old Testament, New Testament, hermeneutics, Christian doctrine, and spiritual formation. Adult learners at OCC complete five, eight-week modules each year. Students participate in readings, lectures, discussion forums, and assignments to demonstrate degree competencies. Full-time students take two classes per module. OCC maintains national accreditation through the American Association of Bible Colleges and regional accreditation candidacy with the Higher Learning Commission. Based in Lancaster, Pennsylvania, LBC incorporates God's word into online and on-campus undergraduate, graduate, and seminary programs. LBC hosts more than 2,000 learners and boasts a 15-to-1 student-to-faculty ratio. The college holds accreditation through the Middle States Commission on Higher Education and the Association for Biblical Higher Education Commission on Accreditation. LBC provides online associate, bachelor's, and accelerated bachelor's degrees in biblical studies, criminal justice, communication, and general studies. LBC's accelerated biblical studies bachelor's degree online includes 120 credits spanning two terms. Students complete four sessions comprising six classes each. Course sessions run between six and eight weeks. The program begins eight times per year and learners can apply up to 30 life experience credits to the degree. 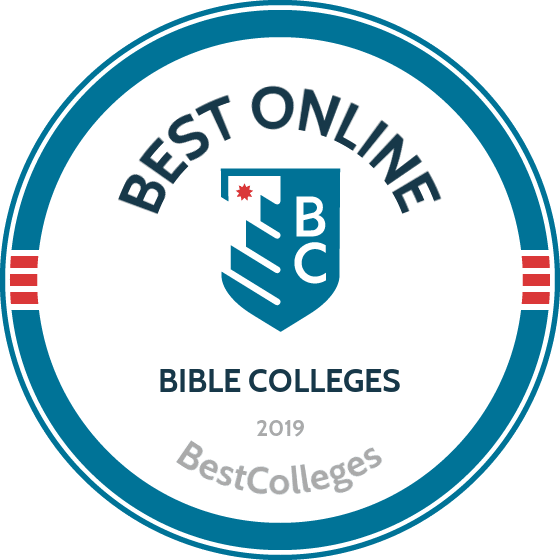 The online biblical studies bachelor's incorporates 36 general education and 54 elective credits alongside 30 credits of biblical studies core coursework. Learners complete classes in the life of Christ, biblical hermeneutics, practical development of biblical interpretation, and the Christian narrative. Additional classes include engaging faith and life, issues in Christianity, and non-Christian traditions. Students can minor in one of eight areas, including business administration, communication, human services, and sport management. Online Bible college applicants submit a ministry reference, transcripts, and a formal essay. Established in 1907, Toccoa Falls College provides academic programs aligned with the values of the Christian and Missionary Alliance. Accredited by the Southern Association of Colleges and Schools, Toccoa Falls offers undergraduate and certificate programs through four academic schools. More than 1,700 learners enjoy the institution's 14-to-1 student-to-faculty ratio from its main campus in Toccoa Falls, Georgia, and online. Toccoa Falls offers online associate degrees in business administration, general studies, and criminal justice. The college offers online bachelor's programs in ministry leadership, youth ministries, criminal justice, and biblical studies. The online bachelor's in biblical studies prepares students for careers in the ministry, Christian teaching, and pastoral service by building foundational knowledge of biblical and devotional literature. The program includes 126 credits of general education, elective, and major courses. Specialized classes in theology, hermeneutics, and apologetics precede a senior seminar. During the seminar, students complete a written doctrinal statement, comprehensive exams, and a service or teaching integration assignment. Learners participate in service and outreach throughout the program to build on classroom teachings in a practical setting. Through supervised ministry assignments, students demonstrate degree competencies and spiritual depth. Applicants submit a personal testimony and transcripts. Toccoa Falls provides discounted tuition for full-time emergency first responders and free online courses for students in specified counties in Georgia. Established in 1987, World Mission University in Los Angeles offers undergraduate, graduate, and certificate programs in divinity, theology, ministry, and music. It holds accreditation through the Association of Christian College Associations. World Mission University offers two online bachelor's degrees. The online bachelor of arts in biblical studies includes 126 credits that learners complete in four years. The curriculum includes general education classes and foundational courses in biblical theology, the Old and New Testaments, systematic theology, and church history. Students complete elective coursework to tailor the degree to their interests. The online bachelor's in biblical studies prepares students to work in the church or in Christian organizations. Learners also gain skills applicable to graduate study. The online bachelor's in Christian counseling incorporates 126 credits of general liberal arts, biblical and theology, and Christian counseling coursework. Required Christian counseling classes in human nature theology, home ministries, crisis counseling, and counseling theory and technology prepare students to take on counseling roles in the church and in their communities. Students in both bachelor's programs participate in student ministry and student workshop courses online. Applicants must demonstrate the acceptance of Christ as Savior and submit transcripts. Established in 1916, Crown College is a private Christian college located in Saint Bonifacius, Minnesota. Affiliated with the Christian and Missionary Alliance, Crown provides more than 40 degrees from its 215-acre campus and online. Crown offers nearly 1,300 students a 14-to-1 student-to-faculty ratio and maintains accreditation through the Higher Learning Commission..
Crown's online bachelor of science degree in biblical studies expands students understanding of the Bible, God's word, and how to incorporate Christian doctrine into daily life. Students complete 125 credits, including 18 credits of Christian core classes in the history of the Old and New Testaments, systematic theology, and Christian evidences. General education and elective courses accompany 18 major credits on subjects such as contextual and missional engagement, concepts of global and ethical leadership, and theology of evangelism and missions. The online bachelor's in biblical studies also allows students to pursue a double major in Christian ministry. Students pursuing a double major complete an expanded Christian core and four additional classes. The degree prepares students to lead ministries and work within nonprofit organizations. It also prepares students for graduate school. Students can complete a Christian studies master's degree in one additional year through the accelerated degree option or apply for Crown's accelerated master of divinity program. Graduates can pursue licensure for ministry within the Christian and Missionary Alliance. Online Bible college applicants submit official transcripts. Christian ministry students also submit a spiritual life essay and statement of faith. Founded in 1914, the Denver Bible Institute became Rockmont College in 1949 and merged with the Western Bible Institute in 1985. Together, they formed Colorado Christian College, which became Colorado Christian University in 1989. CCU currently hosts almost 8,500 learners on its Lakewood campus and online. CCU offers an online bachelor of arts in biblical studies program that focuses on the history of scripture and the role creation, sin, formation, and hope play within holy texts. Students complete 120 credits comprising 39 general education, 42 elective, and 39 major core credits. Core classes include biblical interpretation, biblical tools, personal and social ethics, and systematic theology. Learners also explore how to teach the Bible, assessing techniques to communicate Christian truths to children, adults, and adolescents. A biblical studies capstone course allows students to apply their degree competencies to research or a practical setting. Learners can enroll in the dual-degree program at CCU, completing a bachelor's and master's in biblical studies at an accelerated pace. Students can apply up to nine credits of the undergraduate curriculum to their graduate degree. Designed for adult learners, the online biblical studies program includes convenient five-week classes. Online undergraduates pay $469 per credit with discounted tuition available to military service members and their dependents. CCU holds accreditation through the Higher Learning Commission. Founded in 1871 to train leaders for the Church of Christ, Heritage Christian University is located along the Tennessee River in Florence, Alabama. The institution closed seventeen years later, but reopened as a Bible school in 1947. After transitioning to a private college during the late 1960s, Heritage Christian University received accreditation from the The Association for Biblical Higher Education in 1988. Heritage Christian University's online undergraduate and graduate degrees in biblical studies, ministry, and divinity provide students knowledge and training for service to Christ. The online bachelor of arts in biblical studies program combines 128 credits of general education, biblical, theological, and professional studies coursework. Students complete classes in the gospels, church history, Christian theology, and preparation for missions. The program also includes eight credits of field education and mission practicum coursework designed to blend academic study and experiential learning in cross-cultural and ministry-specific settings. Learners choose a specialization in preaching ministry, family life ministry, or general elective ministry. The preaching ministry emphasis builds communication, counseling, and preaching skills, while the family life ministry concentration builds competencies in youth ministry, nurturing families and teenagers, and marriage and the home. The elective concentration provides students with added flexibility in their studies. To apply to Heritage Christian University students submit transcript information, standardized test scores, three references, and a formal application. Applicants also undergo a background check prior to admission. Opened as a Bible and missionary training school in 1902, the University of Northwestern (UNW) moved to its current Saint Paul, Minnesota campus in 1972. UNW offers more than 75 undergraduate degrees, six master's programs, and boasts a 14-to-1 student-to-faculty ratio. With roughly 3,500 students, UNW holds accreditation through the Higher Learning Commission and maintains memberships in the Council for Christian Colleges and Universities and the Council of Independent Colleges. UNW incorporates prayer, worship, and a biblical worldview into online undergraduate and graduate programs in business management, psychology, divinity, and biblical and theological studies. The biblical and theological studies program prepares students for work in ministry, Christian education, and church organizations. Learners also gain research and writing skills, communication foundations, and religious expertise applicable to graduate study in the seminary, business, higher education, and counseling fields. The online bachelor of arts in biblical and theological studies degree includes 125 credits of coursework to train students in Christian doctrine, biblical customs, and church history. Students complete 28 credits of required classes in historical theology, exegetical methods, and the history of the church, alongside 16 credits in Greek language. Other courses include world religions, ministry foundations, and communicating the biblical message. The degree provides students opportunities to study abroad in Israel as well. Applicants to UNW's undergraduate programs must submit a formal application, transcript information, and standardized test scores. Adult undergraduate applicants provide additional documentation of professional and life experience, and evidence of their dedication to the Christian community. Formed out of the consolidation of several Bible institutes in northeast Pennsylvania, the University of Valley Forge (UVF) first offered classes from its Phoenixville, Pennsylvania location in 1977. Affiliated with the Assemblies of God Church, UVF provides its multi-denominational student body a 12-to-1 student-to-faculty ratio. Accredited by the Middle States Commission on Higher Education and the American Association of BIble Colleges, UVF provides more than 50 undergraduate and six graduate programs to on-campus and online learners. UVF's online degrees include accelerated seven-week and traditional 14-week modules. UVF provides an associate of arts degree in biblical studies and ministry leadership along the 14-week module timeline to build foundational knowledge of the Bible, Christian living, and the ministry. Both programs comprise 60 credits. Undergraduate students complete a 120-credit bachelor of arts in ministry leadership during the 14-week format, studying the Bible, education, church ministry, and principles of leadership. Major courses in intercultural studies, preaching, and pastoral ministry and practice accompany core classes in hermeneutics, world views, and the Old and New Testaments. Students also complete an internship and internship seminar to observe and practice pastoral responsibilities at a local church, marketplace, or church organization. A 36-credit master of arts in Christian leadership further expands leadership competencies and explores models of leadership in church ministries, parachurch groups, and Christian organizations. UVF also offers online master's degrees in theology and worship studies. Learners applying to UVF's accelerated and traditional online undergraduate programs pay $399 per credit. Online graduate students pay $480 per credit. Founded in 1883 through the merger of Mississippi Synodical College and McCombe Female Institute, Belhaven University moved to its current Jackson, Mississippi location in 1897. Between its main campus, extensions in Memphis, Houston, Chattanooga, and Atlanta, and online, Belhaven serves more than 4,500 students. The school offers learners a 12-to-1 student-to-faculty ratio, alongside national accreditations in dance, music, theater, and visual art. Belhaven maintains regional accreditation through the Southern Association of Colleges and Schools Commission on Colleges. Belhaven offers 30 online degrees. All classes run on eight-weeks terms, and include a Christian worldview alongside field-specific knowledge. Online Bible college programs include interactive assignments, video lectures, and readings presented in a convenient, flexible format ideal for adult learners, active military personnel, and frequent travelers. The online bachelor of arts in biblical studies holds true to the institution's mission to prepare students to serve Christ in their personal and professional lives. The 124-credit program combines academic and spiritual understanding of the Bible, theology, and ministry. Students complete 39 core credits in the New and Old Testaments, the nature and purpose of the church, global perspectives, and Christian doctrine. Elective classes allow students to pursue ministry and youth ministry professions, careers in counseling and education, or missionary activities. Learners also gain critical-thinking and analytical skills needed for graduate or seminary study. To apply to Belhaven, learners must submit an online application, application fee, and supplemental information, including transcript information and international documentation. Sponsored by the Church of God, Lee University traces its origins to 1918, and holds regional accreditation through the Southern Association of Colleges and Schools Commission on Colleges. With almost 5,400 students, Lee offers online and on-campus programs in 55 disciplines from its 120-acre Cleveland, Tennessee campus. Offered through Lee's Division of Adult Learning, the online bachelor's in Bible and theology includes two degree tracks: a bachelor of arts, and a bachelor of science. Both degrees include 120 credits and feature the same religion core classes. Students complete 18 credits in the Old and New Testament, Bible study, systematic theology, doctrine, and Christian ethics courses. Students also study the gospels, theology, the history of Christian doctrine, and other specialty areas that meet their personal interests and professional goals. Students in the bachelor of arts in Bible and theology take at least six hours of a foreign language, while their bachelor of science counterparts complete additional general elective classes. The bachelor's in Bible and theology builds a foundational understanding for students looking to continue spiritual and theological study. Learners gain insight into church texts, the Christian faith, the applicability of religious principles, and methodologies for biblical studies. Students complete both degrees in four years. Lee also offers online bachelor's degrees in Christian studies and ministry leadership. The ministries leadership program includes specializations in business, children's ministry, church administration, counseling, discipleship, music and worship, pastoral ministry, and youth ministry. The Division of Adult Learning at Lee holds membership in the Association for Continuing Higher Education, the Association of Christian Distance Education, and the Christian Adult Higher Education Association. Amridge University in Montgomery, Alabama, participated in the U.S. Department of Education's distance education pilot program in 1993 and has been a leader in online, Christian education programs ever since. Amridge carries out its mission to prepare students for Christian service in the workplace, church, and daily life through undergraduate and graduate programs in business and leadership, education, human services, general studies, and theology. Amridge's online bachelor of arts in biblical studies includes 128 credits. Students complete 40 credits of general education classes, 40 program specific courses, and 48 hours of elective coursework. Program classes emphasize the life and teachings of Christ, the Old and New Testaments, systematic theology, Christian history and thought, and biblical languages. The curriculum prepares students for positions as ministers, Christian educators, and church leaders. Learners also develop skills for work with youth populations, missionary service, and preaching. Amridge University also offers an online bachelor of science in ministry and the Bible. Similar to the bachelor's in biblical studies, the curriculum offers comprehensive insights into Christian theology and the history of the church, but also incorporates additional classes in the ministry and effective Christian leadership. Amridge University maintains accreditation through the Southern Association of Colleges and Schools Commission on Colleges. To apply to Amridge University, students must submit a formal application and transcript. Online learners can enroll in 14-week, 10-week, or 8-week courses. Tuition rates vary for first responders, first-time college freshmen, and for specific programs. Affiliated with the South Carolina Baptist Convention, North Greenville University (NGU) offers students a Christ-centered learning environment seeking to foster academic excellence, spiritual growth, and Christian service. Founded in 1891, the private, liberal arts college provides students with more than 50 academic programs from its main Tigerville, South Carolina campus, its sister campus in Greer, and online. NGU's online bachelor of arts in Christian ministries prepares students to apply Christian faith, theological principles, and biblical teachings to their daily lives and professional goals. The program establishes foundations for careers in the ministry, seminary or divinity study, and church service. Students in NGU's online bachelor's in Christian studies complete the program in four years. Eight-week classes include online assignments, virtual class sessions, and real-time interaction with instructors and peers. Students complete core classes in the Old and New Testaments, church history, and systematic theology, while pursuing concentrations in biblical studies, ministry, theology, and youth ministries. Elective coursework and degree specializations allow students to expand their understanding of theology and its vocational applications. Through two ministry practica, learners work with church, ministry, or organizational professionals to apply degree knowledge in a real-world setting. Students also produce a thesis based on their specialization and ministry interests. To apply to NGU's online and adult learner programs, students must submit an application, non-refundable fee, and transcript information. Flat-rate tuition for online undergraduates applies to all coursework, including experiential-learning classes. Initially established as Central College in 1892, Central Baptist College (CBC) became Conway Baptist College in 1952, before taking on its current name in 1962. Affiliated with the Arkansas Missionary Baptist Association, CBC in Conway, Arkansas, provides Christ-centered academic programs to more than 700 students. CBC offers online learners associate and bachelor's degrees in Bible studies, missions, and worship arts. CBC's Professional Adult College Education (PACE) program allows non-traditional students to complete online degrees in business, church administration, and leadership and ministry. CBC's online degrees prepare students for work in ministry, missionary service, application of faith and Christian teachings to business, and to build their personal relationship with Christ. The online leadership and ministry bachelor of science program at CBC incorporates 120 credits of general education, major, and elective classes. Required classes for the major include biblical interpretation, Christian doctrine, church leadership, theology, and basic counseling. Students also study evangelism, church growth, management, and expository preaching. CBC's online bachelor of science in church administration includes a comparable curriculum while emphasizing basic church growth, leadership, and educational programs of the church. Learners can also minor in pastoral studies, religious education, youth ministry, or Christian care. The PACE program allows students to apply work experience for credit and includes weekly meetings on-campus, or through virtual classroom sessions. Applicants to CBC's online programs must submit a formal application, transcript, and standardized test scores. Through more than 70 academic programs, Evangel University builds academic and spiritual excellence among its learners. Established as Evangel College in 1955, and based in Springfield, Missouri, Evangel maintains accreditation from the Higher Learning Commission and endorsement by the Alliance for Assemblies of God Higher Education. Evangel's online bachelor of science in church ministries program emphasizes biblical engagement and spiritual teachings in preaching and leadership. Students develop knowledge and skills for careers in ministry, Christian education, and counseling by gaining fundamental understanding of spiritual formation and discipleship, the Pentecostal church, pastoral care, and church polity. Learners prepare for careers as pastors, church administrators, missionaries, or for continued study in the seminary. The church ministries program also prepares students for ministerial credentials from the Assemblies of God church. The 124-credit online bachelor's in church ministries curriculum includes 79 credits of general education coursework. Students complete 48 core credits in two years through classes in the Old and New Testament, biblical theology, and hermeneutics. Additional core classes in strategic planning for church ministry, church administration and financial management, and spirit-empowered leadership in the church build managerial skills for future church and spiritual leaders. Applicants to the online church ministries degree must have a high school diploma or equivalent with a minimum 2.0 GPA. Adult learners with previous college coursework submit transcript information for up to 64 credit hours of transfer credit. Evangel offers year-round admission, affordable tuition, and three program start dates per year. Founded in 1906 by the Russell Creek Baptist Association as a school for boys, Campbellsville University (CU) now offers undergraduate and graduate degrees from its main Campbellsville, Kentucky campus, regional centers, and online. CU upholds the values and mission of the Christian faith through its Christ-centered academic programs and campus community. The online bachelor of science in pastoral ministries builds strong biblical foundations for careers in the church. Students also gain competencies applicable to roles as religious educators, missionaries, social justice advocates, and nonprofit organization management. CU's online bachelor's in pastoral ministries includes 120 credits of coursework and can be completed in four years. The curriculum incorporates classes in biblical study, missiology, church history, evangelism, and pastoral care. Christian studies core classes in Christian theology, spiritual formation, and Bible reading accompany pastoral ministries classes in Christian evangelism, pastoral ministries, and pastoral care and counseling. Students can complete electives in educational ministries, theological and missiological studies, and subsets of ministries, such as sports and drama, to focus the program on specific personal and professional goals. During the Christian studies internship, learners participate in supervised fieldwork with an experienced minister, church administrator, or Christian educator to gain insights into the field. Applicants to the online pastoral ministry program submit a formal application, transcript information, and standardized test scores for consideration. CU accepts up to 72 transfer credits from a regionally accredited institution. CU maintains accreditation through the Southern Association of Colleges and Schools Commission on Colleges. Founded as Christian Workers University in 1927, Manhattan Christian College (MCC) became Manhattan Bible College in 1930, before taking its current name in 1971. Accredited by the Higher Learning Commission and the Association for Biblical Higher Education, MCC offers academic programs based in the application of God's word, Christian discipleship, spiritual integrity, and a life of worship. As one of MCC's degree completion programs, the online bachelor of science in biblical leadership includes 120 credits. Students complete general education and elective classes alongside 24 credits of Bible, theology, leadership, and ministry coursework. Bible and theology courses include basic Christian doctrine, Christian beginnings, and the life and teachings of Jesus. Leadership and ministry classes emphasize biblical foundations of leadership, evangelism and church growth strategies, and pastoral care and counseling. Learners complete a Christian service requirement through practical service activities determined by a supervising faculty member. MCC's online bachelor's in biblical leadership prepares students to enter ministry, or to advance within their current church role. Individuals who seek to serve as a church elder, educator, or missionary leader gain competencies in study and application of biblical principles. Applicants to MCC's online bachelor's in biblical leadership submit an application, application fee, personal reference form, transcript, and standardized test scores for admission. Students who transfer a minimum of 40 credits begin the program at any of MCC's five start dates. Located in Dallas, Texas, Dallas Christian College (DCC) carries out its mission to train and engage Christians for work in the church and in the secular world. On-campus and online programs in practical ministries, business, worship arts, and teacher education balance a Christian worldview with specialized knowledge and skills. DCC holds accreditation through the The Association for Biblical Higher Education to grant certificates and undergraduate degrees. DCC offers an online bachelor of science in practical ministries and bible that builds biblical foundations, leadership skills, and ministry experience for individuals seeking careers in the church or a religious organization. The program includes three tracks, all tracks require 129 credits. The intercultural studies track incorporates classes in general education, the Bible, and practical ministries, alongside emphasis classes in urban missions, church growth, and cross-cultural missions. The ministry leadership curriculum emphasizes women in the ministry, preaching, foundations of spiritual formation, and servant leadership. The youth and family ministry track focuses on urban youth ministry, marriage and family, and developmental psychology. To apply to DCC's online bachelor's degrees students must submit an application, nonrefundable fee, letter of recommendation, and transcript information. Applicants also write an essay addressing their academic and spiritual goals, and how DCC fits into their lives. DCC's FLEXCampus offers flexible, six-week classes that incorporate real-time interactions, assignments, and assessments. DCC also accepts portfolios demonstrating previous work experiences and competencies gained from real-world activities as alternative transfer credits. Students earn a maximum of 30 demonstrated competency credits. While Christian liberal arts universities and colleges offer a more broad-based curriculum, the best online bible colleges offer focused degree programs and fellowship opportunities with like-minded people who want to devote their lives to service in a faith-based occupation, often as pastor of a church or in the role of a missionary. In addition to comprehensive online programs that center on bible study and preparing for ministry, bible colleges also provide students with off-campus opportunities for community outreach with pastoral training at homeless shelters, nursing homes, prisons and other venues. Students who are pursuing online degree programs in Biblical Studies and Ministry frequently have a chance to socialize with other students and professors through online discussion groups, on-campus meetings or at local churches and community events. Graduates from online bible colleges have an opportunity to pursue several different careers. The field continues to grow as religious organizations expand and add new administrative and managerial positions. While occupations in the religion sector aren't known for offering the highest paying salaries, the rewards can be great for those who choose to follow their passion and pursue a vocation that makes faith and serving others a priority. The table below highlights median annual salaries for four of the most popular vocations pursued by graduates from bible college online programs. Minister or Pastor: The minister of a church performs religious worship services and provides spiritual and moral guidance to members. Depending on the size of the church the minister may also be responsible for administrative duties and hiring other staff members. Bible Studies Professor: A professor of bible studies may teach at a bible College or teach theology or a specialized religious topic at a liberal arts college or university. Education and training may include studying religious philosophy, plus in-depth study of the bible and religions around the world. Choir Director: The Choir Director of a church has specialized music skills in addition to a college degree from a university or bible college. Duties include working with the minister to coordinate appropriate songs for worship services, overseeing choir rehearsals and recruiting members to perform with the church choir. Youth Director: Youth directors at many churches are frequently assistant pastors. The youth program director coordinates classes and activities, and works with young people of the church to strengthen their faith through bible study, counseling sessions and community outreach activities. There are many other career opportunities available to graduates of online bible colleges. You might work as a business administrator for a religious group, take on a counseling or administrative role with a faith-based nonprofit organization, or serve as a missionary in a foreign country. Some larger churches and religious groups also employ administrators who oversee missions, community outreach activities and other services. For those hoping to find work with a church or other faith-based organization, a bible college online program can provide the training and certification necessary for a respected and meaningful career. Council for Christian Colleges and Universities: CCCU offers more than 100 programs and services to meet the needs of Christ-centered colleges and universities. In addition to providing professional development and research resources, the website features job postings and networking opportunities. Association for Biblical Higher Education: Responsible for evaluating and accrediting many of the nation's bible colleges, this association website offers a list of accredited colleges, career listings and practice exams accessible to faculty and students. Association of Theological Schools: In addition to accrediting theological schools, ATS offers valuable resources for students trying to decide which bible college to choose and how to evaluate career goals. Moody Bible Institute Career Development Center: Affiliated with Moody bible Institute, the Career Development Center provides career assessment assistance to potential students and assists graduates and churches throughout the country with job listings, counseling and networking opportunities. Ratio Christi: Bringing together students and faculty around the world to discuss historical, philosophical and scientific reasons for following Jesus Christ, this global movement encourages a renaissance of Christian thinking at universities and bible colleges.